ma programme in art and media practice at the university of westminster. 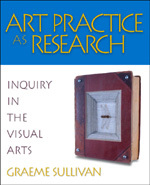 Art Practice as Research: Inquiry in the Visual Arts (2010 edition). SAGE. Henk Borgdorff, 2010: Artistic Research as Boundary Work, pages 4-11. In How does Artistic Research Change us? Proceedings of CARPA 1 – 1st Colloquium on Artistic Research in Performing Arts. Theatre Academy, Helsinki November 19.-21., 2009 Performing Arts Research Centre, Theatre Academy 2010. ISBN 978-952-9765-59-1. Previously published in: Corina Caduff, Fiona Siegenthaler and Tan Wälchli (Eds) Art and Artistic Research / Kunst und Künstlerische Forschung Zurich Yearbook of the Arts / Zürcher Jahrbuch der Künste, vol.6, pp. 72-79 Zürcher Hochschule der Künste (ZHdK) and Verlag Scheidegger & Spiess, 2010. Travelling Images: Memory, Time and the Analogue Media Experience. the posts in the thinking practices blog by the respective author(s) are licensed under a Creative Commons Attribution-NonCommercial-ShareAlike 3.0 Unported License. Based on a project developed by paula roush with the participants in the MA in Art and Media Practice in the University of Westminster.